Jeju-do (제주도) is Korea’s largest island, as well as the favorite domestic holiday destination for both locals and travelers because of its beach resorts, volcanic sceneries, and beautiful landscapes. Jeju-do is known for its “three plenties” – wind, rocks, and women. “Wind” refers to Jeju-do’s geographic location that attracts lots of wind. Today, Jeju’s wind has been used to generate electricity for every house on Jeju-do. “Rock” refers to the formation of the island from an outpouring of lava from Hallasan. In fact, ninety percent of its surface is basalt. Stone is mainly used for construction, for building up landmarks that separates the village other villages or tombs. “Women” refers to the diving women who learned to dive for octopus, abalone, clams, squid and seaweed in the past years to feed the family while the men were lost at sea for years . We spent three days two nights in an Airbnb family cottage in Aewol-eup, in the west part of Jeju-do. On Saturday May 20, 2017, we took the domestic flight from Gimpo International Airport (GMP) (김포국제공항) in the morning to Jeju International Airport (CJU) (제주국제공항) with T’way Air (티웨이항공). It was a very short 1 hour 10 minutes flight. Upon arrival, we took the bus 100 heading towards Jeju Intercity Bus Terminal (제주시외버스터미널). From there, we took bus 700 heading towards Seongsan Port (성산항). One-way trip costs 3,300 Won. After a 1 hour 40 minutes bus ride, we arrived at the port, where we took a ferry from the Seongsan Port to Udo Island (우도). The price of a roundtrip ticket was 5,500 Won, and the ferry runs every 30 minutes to 60 minutes between 8:00a.m. and 6:00p.m. Getting around Udo Island is very convenient as there are a few options available; Bike, motorcycle, car, scooters, or bus. If you want to drive, you need either a Korean or an international driver’s license. We decided to rent bikes, and it cost 5,000 Won for 3 hours. The first location is the Seobin Baeksa (서빈백사), a white beach that has appeared regularly in films and TV commercials thanks to its breathtaking white sand and emerald sea color. The sea. This makes Seobin Baeksa one of the most popular tourist attractions in Jeju-do, along with Hallasan Mountain . On our second day, we booked a full day with a Taxi tour. We met with our taxi driver, M. Kim at 9:00a.m. in front of our Airbnb, and we reviewed the list of attractions that we wanted to go for the day. Information about the Taxi tour we booked. The cost was 150,000 Won for the entire day. The first location was the O’sulloc Museum (오설록티뮤지엄), where we could learn about Korea’s traditional tea culture. You can also see the Seogwang Tea Garden (서광다원) and Innisfree Jeju House (이니스프리 제주하우스) right beside the museum. Please try the Osulloc green tea ice cream next to the lotus pond in the indoor garden at the O’sulloc Museum! After that, we headed to the Cheonjeyeon Falls (천제연 폭포), which is also called the “Pond of God” is a three-tier waterfall. According to the ancient legend, seven nymphs would come down from heaven and bathe in the waterfall’s pond at night. These nymphs can be seen on the Seonimgyo bridge in the Cheonjeyeon valley area. After spending about 30 minutes in the waterfalls valley, we headed towards the famous Jusangjeolli (주상절리). On our way there, we made a stop at the famous bench kiss scene shooting location of the Korean drama Secret Garden located at the Seaes Hotel and Resort. (씨에스 호텔& 리조트). 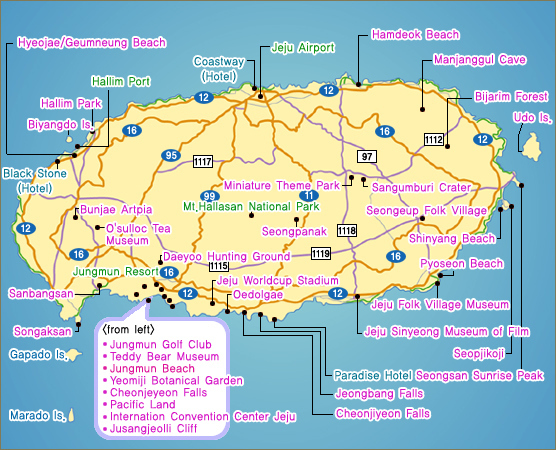 Jusangjeolli, officially known as the Daepo Jusangjeolli Cliff (주상절리(대포동지삿개)) is a renowned cultural monument of Jeju-do. The Jusangjeolli Cliff was formed when the lava from Hallasan Mountain erupted into the sea of Jungmun. It is best known for its distinct hexagon shaped rock pillars of various sizes that look as if they were carved out. After lunch, we headed to Oedolgae Rock (외돌개), an amazing rock surrounded by beautiful islands in Seogwipo. It is known for being the filming location for the popular 2003 Korean drama series Daejanggeum. The Oedolgae Rock also tells the story of a grandmother, who sent out her husband to the sea. She stood facing to the sea every day in hopes of seeing him return, but she turned into stone before they could reunite (represented by the tall rock on the picture below). One day, the husband finds his way back and decides to be with her forever (represented by the smaller rock to the left). Our journey followed by a visit to the Cheongjiyeon Waterfall (천지연폭포) and Jeongbang Waterfall (정방폭포). Cheongjiyeon Waterfall means Sky connected with land and appears to be falling from the heavens. Before seeing the waterfall, there was about a kilometer tropical feels path walk. We could see a great variety of plants, trees, and animals. Moreover, there were many stone guardians of Jeju island known as dol hareubang (stone grandfather). The waterfall itself is 22m high, 12m wide and 20m in depth. The Jeongbang Falls (정방폭포) is the only waterfall in Asia that falls directly into the ocean water. Before seeing the waterfall, we had to climb about a hundred stairs. If you want to take pictures close to the falls, you also need to climb through many rocks. I also suggest taking a look at the rocky cliffs leading to the falls, where you may spot some women divers in action! For dinner, our taxi driver brought us to a famous restaurant for black pork BBQ where we had samguepsal (삼겹살) for 19,000 Won. On our last full day, we decided to climb Hallasan (한라산) the highest mountain in South Korea with an altitude of 1,950 meters. There are different trails along Hallasan. To climb the entire mountain, it would take you the entire day (around 10hours), but we decided to do the alternative shorter trail – Yeongsil trail (영실) going up (3.7km) to the Witse Oreum Shelter (윗세오름) and then the Eorimok trail (어리목) going down (4.7km). We took the bus 740 from Jeju Intercity Bus Terminal to the Yeongsil Ticket booth stop. Then, we walked for 2.5km uphill to the Yeongsil Entrance. (If you don’t want to walk, you can also take a taxi). To go back, we took the bus 740 to Jeju Intercity Bus Terminal. Then, we headed directly to Jeju airport by taking the bus 755. « What’s The Deal with Fine Dust?